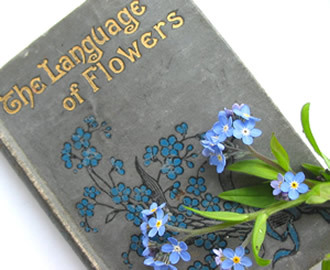 During the Victorian era, people often gave each other flowers and used the “language of flowers” (sometimes called floriography) to express feelings that, because of the propriety of the times, could not be spoken. The flowers said it all. Each flower, herb, and vine had a special meaning, and it was important to carefully choose those that best conveyed just the right sentiments. Small bouquets of tightly gathered flowers and plants, called Tussie Mussies, were common. These “talking bouquets,” designed to carry specific personal messages, were often given by gentlemen suitors of the era to the young women they were courting. Books on the language of flowers, listing flowers in alphabetical order alongside their illustrations and meanings, were popular and helped to identify the hidden messages to be found in floral gifts. By the end of the Victorian era, greetings cards were also widely available, depicting an appropriate flower for each occasion. 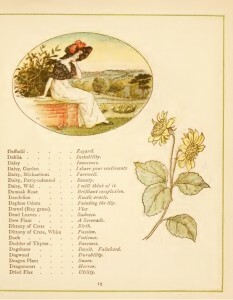 Today, though we still “say it with flowers,” we no longer personally selected flowers based on their meanings. Instead, we choose flowers by color or preference and rely on the expertise of professional florists to create a perfect bouquet or floral arrangement. Excerpted from The Language of Flowers. LONDON: GEORGE ROUTLEDGE AND SONS, 1884. Complete book is viewable online at Gutenberg Project and The New York Public Library Internet Archive.